A Perthshire-based chef is adding his support to Quality Meat Scotland’s programme of health and education activity in Scottish schools. Steve Craik, from Crieff, will be working with QMS and visiting schools around the country to encourage youngsters to understand the importance of eating a healthy diet and the role played by beef, pork and lamb in good nutrition. Chef Craik has won many awards for his culinary skills and his career has included working with Gardner Merchant in Glasgow and, for more than a decade at The Famous Grouse Experience, Glenturret Distillery, Crieff, where he was executive chef. He has also demonstrated his skills extensively overseas where he has championed top Scottish food and drink in countries as far afield as Hong Kong, Brazil and Russia. 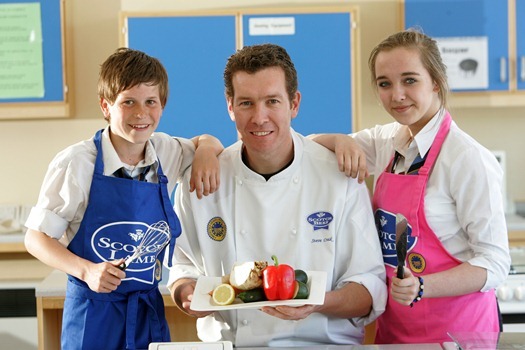 Sewell and Nicole England from Largs Academy joined chef Steve Craik during a demonstration. Craik’s support with Quality Meat Scotland’s activities in schools adds weight to the wide range of work the organisation undertakes to encourage children and people of all ages to enjoy a healthy lifestyle and eat well. This month sees the launch of QMS’s Schools Meat Voucher Scheme to help pupils learn to cook quick, tasty and healthy meals. The scheme, which is again being rolled out Scotland-wide, offers vouchers worth up to £100 to secondary schools to exchange for top quality Scotch Beef, Scotch Lamb and Specially Selected Pork at local retailers. The scheme was developed by QMS to ensure tight school budgets do not result in schools being unable to afford fresh, red meat products for cookery lessons and pupils leaving school without the skills to cook simple, healthy meals. Home Economics teachers across Scotland should apply for their voucher before 1st December 2012. The vouchers are worth up to £100, depending on the number of pupils on the school roll, and are valid until 1st February 2013. Vouchers can be redeemed at independent retailers and butchers that are members of the Scotch Butchers’ Club. Jennifer Robertson continued: “The feedback from schools has been very positive with one school in North Lanarkshire telling us that they loved being able to give the pupils good quality meat to work with – it was a great treat and an education about quality of food. They said it gave them the opportunity to emphasise the versatility and the value of meat in our diet. Home economics teachers can apply for their voucher via the QMS website at www.qmscotland.co.uk – click on Health and Education.